This combination makes the most delicious snack for lunch or even as a starter! 2. Sift the dry ingredients into a large mixing bowl. In a separate bowl, mix the egg with the Alpro Almond milk and add to the dry ingredients. Whisk together until you have a smooth batter. Add the sweetcorn and mix to combine. 3. Place the tomatoes on a baking tray and sprinkle over the crushed garlic, thyme, salt and pepper and a little olive oil. Bake in the oven for about 20-30 mins. Remove from the oven and sprinkle the tomatoes with the balsamic vinegar. 4. Heat a little sunflower oil in a non-stick frying pan until hot, spoon the batter a tbsp at a time and cook the fritters on both sides. 5. 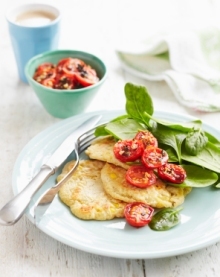 Place a couple of the fritters on a plate and top with the tomatoes and the spinach to serve. Tip/Serving Suggestion: Add some zing with a dash of sweet chilli sauce.